Victoria Station to Ealing Broadway, on the District Line of the London Underground. At around 9:15 on the evening of Thursday 23rd August, 2018. That was the precise moment I understood why the AKG N5005 is thehigh-end earphone for today. And it’s not just because it sounds excellent. You see, on that particular moment, I was on a train half full of people, the majority of whom were wearing headphones or earphones. Some of these headphones and earphones were quite expensive, although probably not N5005 expensive. Some were noise cancellers, some were deep-dive earphones used to drown out the clatter of new trains on very old tracks. And as I looked casually from listener to listener, one thing jumped to my attention... only one of them was using a cord between phone and headset. Not one of them was using anything apart from a phone or a tablet, either... Although Digital Audio Players sound like a great idea to the audio cognoscenti, in the neon-lit reality that is the Tube train, they don’t exist. This might be a sweeping generalisation (drawn from watching people on a train carriage) but such observations on trains and ‘planes around the world shows a correlation. That correlation means that high-end personal audio faces something of a crisis that AKG resolved in the N5005’s box. Because, in the comprehensive package of AKG’s top earphone sits a Bluetooth receiver of pretty good quality. Despite our love for devices like the excellent Chord Mojo and Hugo portable DAC/headphone amp/streamer, I think too many of today’s listeners rely on their phones and – regardless of how good the headphone or earphone – if a product relies solely on a wired solution, prospective buyers will smile sweetly and pass buy. That’s how fast things have changed in the real world of personal audio, and AKG jumped the right way! Setting aside the Bluetooth device and staying with ‘legacy’ cable (hey pigeons... meet the cat! 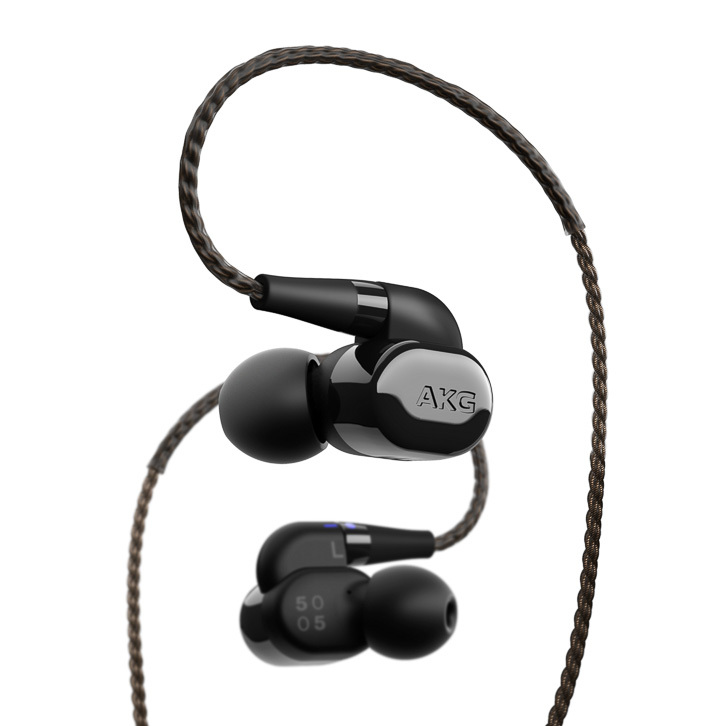 ), the AKG N5005 is a formidable piece of earphone engineering, set in one of the most comprehensive packages in audio. If there is such a thing as tyranny of choice, the AKG N5005 box gets close. 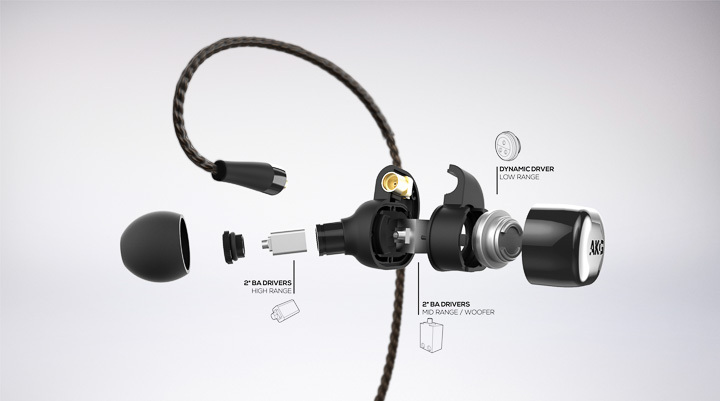 There are seven sets of ear-tips as standard (and there are also Comply tips – not supplied – that provide even greater levels of rigidity of insertion), a de-gunking tool, a 3.5mm standard braided cable, a 2.5mm balanced braided cable, the aforementioned Bluetooth adaptor (eight hours play, two hours charge), the two-pin in-flight adaptor for in-flight systems that haven’t been in use for the last 25 years, a small shell case to carry everything in, and a set of three different filters to gently shape the sound of the N5005. Phew! The earphone system itself is equally comprehensive, in that it’s a hybrid system that combines a 9.2mm dynamic driver for the bass that sits closer to the outer ceramic section of the earphone, coupled with a four-driver balanced armature array for the mids and highs. After that five-driver system comes the easy to drop-in quartet of filters to tune the sound to your tastes. As standard, the N5005 is fitted with the grey-ringed ‘Reference’ filters, and a supplied card includes a pair each of the black ‘bass boost’, green ‘mid high boost’, and white-ringed ‘high boost’ filters. The most aggressive of the four is the bass boost, the rest being mild variations on a theme. I liked the ‘reference’ and ‘mid high’ filters as they seemed to work extremely well with voices and the mid-high just gave a touch more presence. Even the ‘high boost’ was comparatively mild, and this should be applauded; there is a temptation in many earphone systems to show off just how much detail balanced armatures can resolve by throwing detail at your ears in an unrelenting manner. Even at it’s most forward, the N5005 doesn’t push too far, and that restraint deserves praise. As does the fact the filters are easy to install (some models require the dexterity of a Jimi Hendrix and needle-width fingers to swap out their filters – not so, AKG!). Similarly, the interchangeable cables are easy to switch, but not so easy they fall out. Their over-ear design also helps keep the 11.4g earphone in place.